Daphne is an evergreen shrub with deliciously scented flowers. The fragrance lingers in the air in the garden, inviting you to get closer. The fragrant flowers may be light pink or white. Flowers bloom in late winter to early spring, depending upon your region. Plant leaves are either leathery, dark green and shiny, and one type is variegated with yellow-tinged edges. 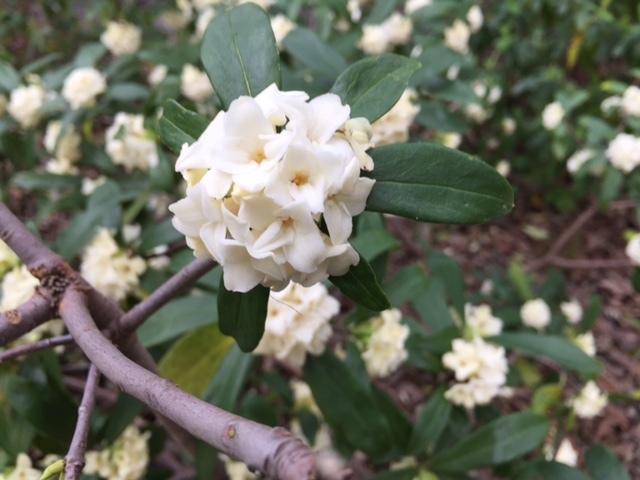 These slow-growing shrubs have a mounding shape and can reach 3-6 feet tall depending on variety. The plant is not long-lived, usually dying after about 8-10 years. 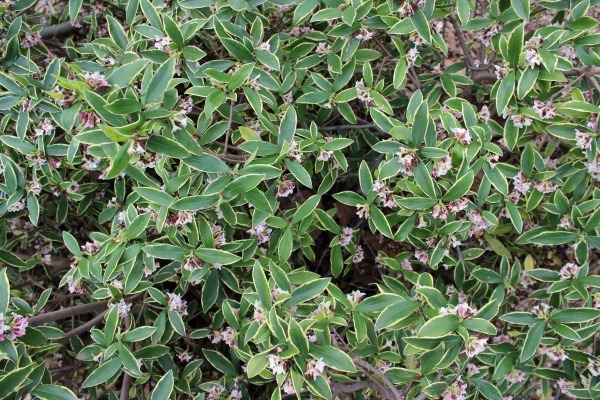 Daphne is native to China but grows well in other places with similar climates. There are three main daphne cultivars. D odora f. Rosacea has white and pink flowers, Rubra has dark red-pink flowers and ‘Aureomarginata’ has yellow edged leaves and is the hardiest of the three to grow. Plant on a slight mound to encourage good drainage. Daphne doesn’t transplant well, so choose the space wisely so you don’t have to move it later. Add mulch around the roots. Give plants deep water, but don’t keep soil too moist. This plant’s flowers are attractive to bees, butterflies and birds. It’s especially helpful to have plants with flowers in your garden this time of year, when other sources of flowers/food may be scarce. All parts of of the plant are poisonous if ingested. See the pet poison hotline for more information. Keep away from animals and small children. Keep away from animals and small children. Sun/Shade: dappled shade, grows well under trees. Water Requirements:regular water, but don’t keep soil moist. Pruning: prune gently for shape after flowering. Other needs: well-drained soil. Does not transplant well.